Last October an accident happened on a road in Singapore. A 4 year old child and the family’s helper accompanying her were struck by a car as they were jaywalking across a two by two-lane street, resulting in the death of the child. The tragedy is reported in this Straits Times article. The report mentions that the jaywalking took place near an overhead bridge, where pedestrians can climb up to cross the road, with pictures showing the bridge perhaps 20-30 meters away. 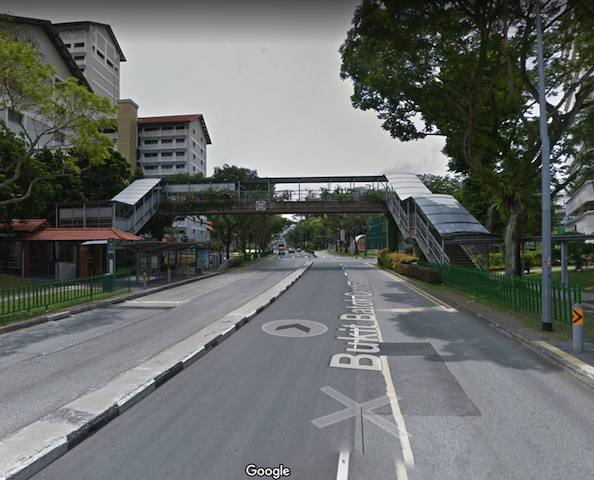 An overhead bridge for pedestrians on Bukit Batok Central road. It is at least 4.3m high to let double decker buses go. To this there are several responses. The driver was taken in on charges of causing death by rash act. One neighbour points out that jaywalking is common around here. A different one states that “barely anyone uses the overhead bridge, 95% jaywalk”. Comments sections are both filled with compassion for the mother as well as questioning why the helper did not use the overhead bridge. I relate this particular incident to a story I read some time ago, in an article I cannot trace the source of unfortunately. A doctor in Atlanta pronounced dead a woman in old age who met with a paralysing sunstroke while walking on the side of the road. This fatal loss of consciousness can be explained by many factors: exhaustion, dehydration, the high temperatures on that day, and will be logged as such on the medical report. But the woman was walking on the side of an unshaded interstate highway, an urban desert with no commercial or human activity for a few miles and the only way for her to reach her destination. For the doctor, the cause of death ought to be written as “bad urban planning” instead. The case of the overhead bridge could fall under the same category: it is bad urban planning to expect people to use an infrastructure that they are empirically not using. The low risk, low cost alternative of jaywalking is simply more attractive than the lower risk, high cost – walking up the equivalent of two floors of stairs and down again – of taking the overhead bridge. This may be due to our inherent incapacity of evaluating the chances of very low probability events to happen, described in detail by the behavioural economics literature. Here the concept of desire line is useful. Humans are natural effort minimisers: if a shorter route exists, they will find it. Think of a brown line of stamped-upon soil traced through a path of green grass to cut a corner (as shown in the next image): that is a desire line. In her book Street Fight the author J. Sadik-Khan, previously transportation manager of New York City, explains that to make the city more comfortable to pedestrians, she sent dozens of surveyors to track and find these desire lines where they exist. Where are people jaywalking? Where are they cutting corners? With this data, she and her team redesigned streets so that people can do either of them safely, with a proper pedestrian crossing for example. 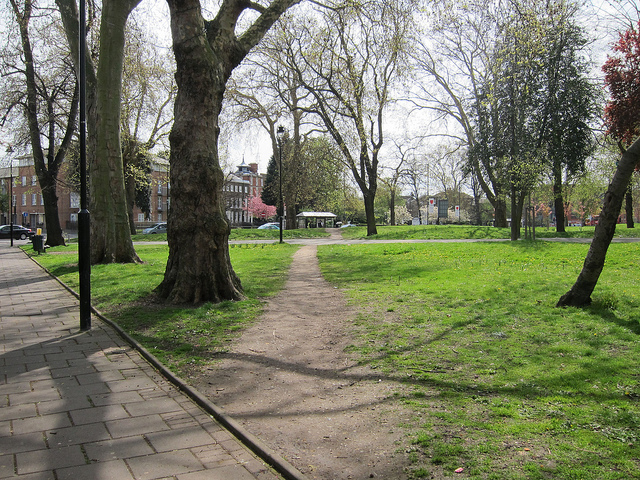 Desire lines are a natural manifestation of our effort-minimising brain and should be encouraged rather than hampered. To come back to Singapore, if people are crossing the street because they have just been dropped at a bus stop and if among the alternatives of 1) an overhead bridge, 2) a pedestrian crossing 100 meters away and 3) jaywalking, the latter one is the most frequently recorded, it is perhaps time to think of changing the infrastructure. That Singapore will often respond to desire lines by fencing off the area sends a rather unfriendly message to pedestrians. Here the road infrastructure is entirely designed with cars in mind, which may seem like a no-brainer but actually deserves a second thought. Overhead bridges yield a more fluid traffic, but they are inherently dangerous if people are not using them. Additionally, it is hard to impossible for the elderly and disabled citizens to cross them without a lift. The government is continually adding lifts to existing overhead bridges, but my observations are that many of them still do not have one: according to this response from the government, around 400 out of 450 overhead bridges are not equipped. Nonetheless, one might wonder if the operational costs of building and maintaining the lifts are not worse than having a pedestrian crossing instead. The time spent waiting for the lift on the way up and down might even encourage more jaywalking where possible. Either way, to build a safe, walkable, pedestrian-friendly city, answering desire lines with improved infrastructure that goes with their flow rather than against it is a crucial step forward. Perhaps then further “death by bad urban planning” can be averted.